When making a soup, I have seen a lot of additional ingredients being added like tomato paste, chopped tomatoes, heavy cream etc. 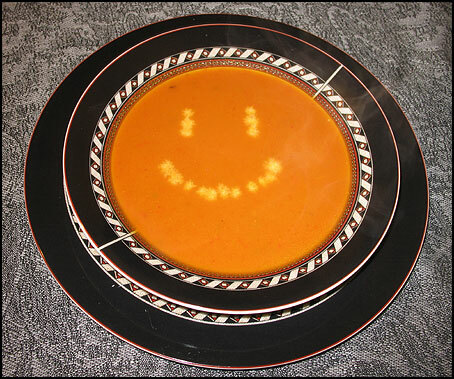 So I thought to make this very simple soup without any additional stuff. 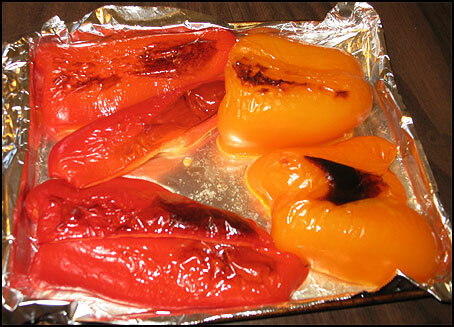 I love the smell of roasted pepper. So I thought to omit any tomato paste or tomato puree to make sure the soup definitely has that strong roasted pepper flavor. Also I used just 2% milk instead of heavy cream. Turn on oven to the broiler setting with temperature 450F. Chop the flesh into small pieces. Add oil to a deep saucepan and when hot add onion and rosemary and cook on low flame for about 5 minutes. Let cool a bit and process the soup in a processor to a smooth puree. okay!..I’m the kind of person that puts alot of stuff in soups!! but you’re right..simplicity is something to aim for in cooking!! I will try to stick to your recipe….!!!! I really thank you for the photos..i think they are always a good idea!